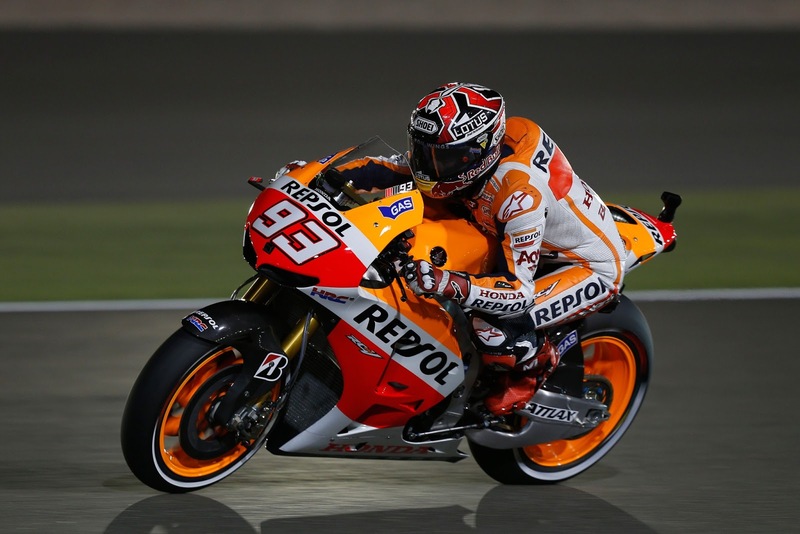 As if to prove that his earlier efforts in MotoGP FP2 were no fluke, Repsol Honda’s Marc Marquez did exactly the same to the opposition in the latest Free Practice session in Qatar ahead of qualifying tomorrow. The Spanish sensation set his best lap of 1:56.084s on his last flying lap of the session to pip the Factory Yamaha of Jorge Lorenzo by just 0.001s. Lorenzos best lap came on lap nine of seventeen and looked unbeatable until Marquez got in to his groove. Dani Pedrosa is yet to find his pre-season testing form at the very dusty and cool desert circuit, posing just the sixth fastest time of 1:56.502s, almost half a second behind his team mate and compatriot, although the tiny Spaniard can take a little solace in breaking the speed trap at 213.8mph, the highest top speed so far. Yamaha Tech3 front man Cal Crutchlow set the third fastest time a 0.1s ahead of Valentino Rossi, looking very at home back on the Yamaha, whilst, more surprisingly, the man who filled the boots of the nine-time world champion at Ducati, Andrea Dovizioso, was only 0.001s shy of the The Doctors time. In what must be a great confidence boost for Ducati Corse, especially with Nicky Hayden securing eighth place just half a second shy of the time set by Marquez, both factory Ducati riders made it through to the new qualifying system at the first time of asking. It was a great session for Crutchlows team mate Bradley Smith, the Brit rookie posted hi fastest time of the weekend in the session and finished a very creditable ninth and ahead of more seasoned riders and wasn’t the lowest placed of the new boys. That honour befell Andrea Iannone who, despite qualifying outside the cut-off for Q2, kept his team mate Ben Spies at bay to secure the eleventh fastest time. The new qualifying system means the top ten riders in FP3 are safely through the main Q2 tomorrow evening, these being Marquez, Lorenzo, Crutchlow, Rossi, Dovizioso, Pedrosa, Bautista, Hayden, Smith and Stefan Bradl. The final two places are made up of the two fastest riders from Q1 tomorrow evening prior to the main MotoGP qualifying practice, the positions held currently by the Pramac Ducatis of Iannone and Spies but with Aspar CRT rider Espargaro and PBM’s Yonny Hernandez looking to depose them. The new qualifying system has added an edge to FP3, watching the CRT riders loitering for a tow in such an early session to try and get themselves the best chance of reaching the newly-hallowed top ten all makes for a very good show.